Do you like Kraken Black Spiced Rum? Do you like the idea of a black Christmas tree? 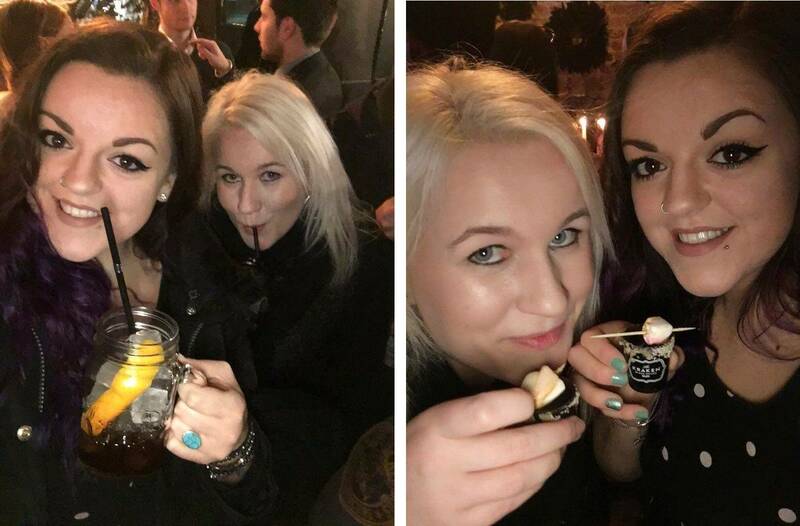 Awesome time at the @thekrakenrum_uk #thinkinkpines pop-up rum bar launch party last night! Blog coming soon ? 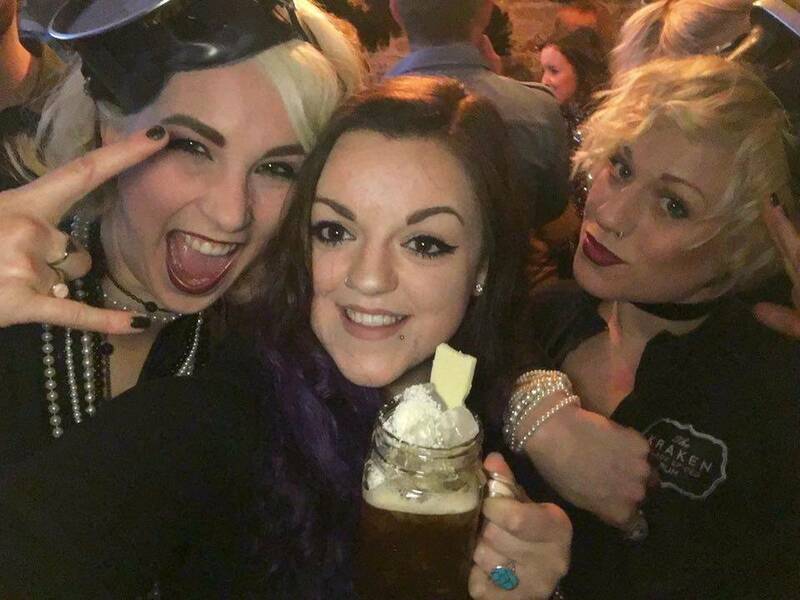 On Tuesday Kraken Black Spiced Rum invited myself and Lissa (Girl At The Rock Show) along to the launch night of Think Ink Pines – a pop up rum bar and a Christmas tree shop! They don’t sell ordinary Christmas trees however, these ones are black! 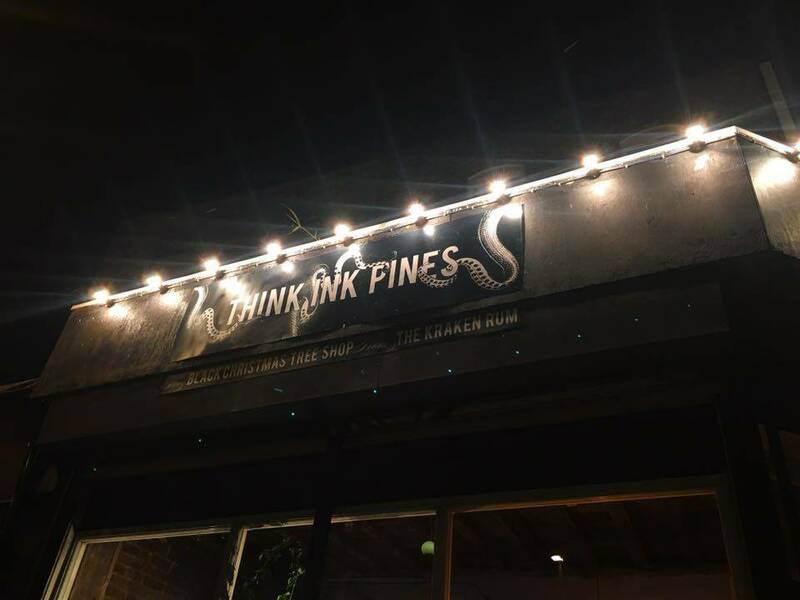 Apparently Kraken have taken real trees and using squid ink* have dyed the naturally green pines, black… Word on the street is that this is the first of it’s kind! Myself and Lissa with the Kraken Hunter! 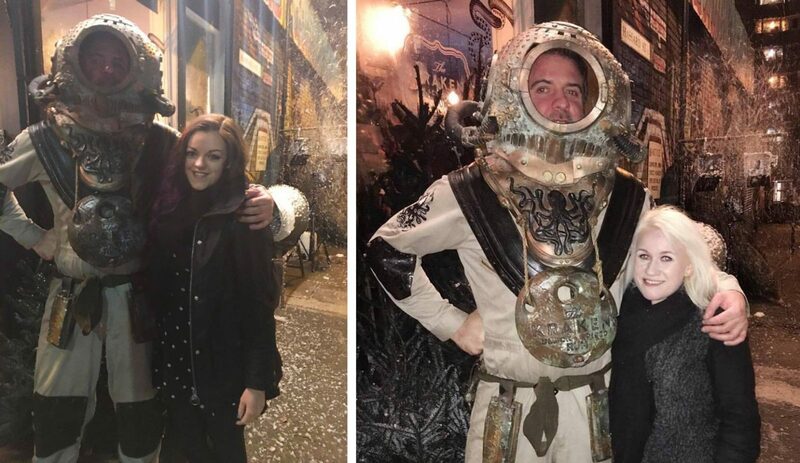 When walking up to this unique shop, a ‘Kraken Hunter’ was stood outside, whilst a snow machine whizzed a flurry of foamy snowflakes around in the wind… Lissa and I quite enjoyed the fake snow (even if it did feel really wet and stuff) and had a cheeky picture with the Kraken Hunter, naturally. When we walked in, the bar was decorated beautifully with black foliage and firs, a giant black Christmas tree, and Kraken themed decorations. We were greeted by two girls dressed in quite glamorous diving gear (not sure how effective it would be, should they actually have to go diving) handing out an unlimited supply of Kraken based cocktails. There was also music which alternated between DJ and a rock band called Heck! If you have a penchant for rum and fancy visiting this weekend, the drinks we sampled are available for just £5. The five specially created cocktails include: Squid Bite (Kraken Rum, Hot Mulled Cider, Apple Slices), Black Espresso (Kraken Rum, Espresso, White Sugar Syrup, Shaved White Chocolate), The Old Kraken (Kraken Rum, White Sugar Syrup, Aromatic Liquer, Aromatic Bitters, Orange Twist), Perfect Storm (Kraken Rum, Ginger Beer, Lime Wedge), and Kraken ‘S’pore’ (Kraken Rum, Crackers, Roasted Marshmallow). Sadly I didn’t get a good picture of the giant black Christmas tree in the corner of the bar, because the mood lighting was a little too moody (cool, but moody). HOWEVER I did notice the boxes of Kraken under the tree – my kinda presents! 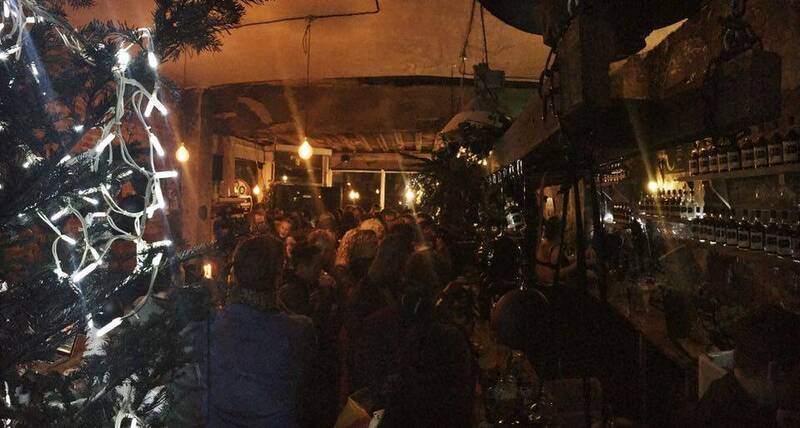 I think the venue was perfectly decorated to fit the theme (I especially loved the little Kraken bottles hanging amongst the pines), and a lot of thought had clearly gone into it. Aside from being very very busy (and a liiittle toasty because of all the people), it was an absolutely lovely evening with some of my wonderful friends. I definitely recommend getting down there to sample the funky Kraken cocktails and get yourself a black Christmas tree while you’re at it! But hurry, there’s not long left, it’s only open until Sunday 13th December! *I’m not entirely sure how I feel about the notion of using squid ink to make black trees (doesn’t sit will with my Vegetarianism)… As a lover of all animals it would be good to know whether any squids harmed in the producing of the ink/making of the trees?